Walmart has begun offering banking services designed for bargain shoppers that seek a checking account with lots of features and low fees. Walmart itself is not a bank, but the GoBank account is only available through Walmart, with banking services provided through Green Dot Bank. Is the GoBank account right for you? It can be a good fit for tech-savvy, fee-conscious consumers, especially if you’ve had any trouble opening a bank account in the past. Watch out for long hold times on check deposits, set up a direct deposit to avoid fees, and make sure to open a savings account somewhere else, that pays interest. Before you open any new bank account, shop around and compare offerings from online banks, local banks and credit unions, and traditional banks. If you don't have any history of bouncing checks and you'll set up direct deposit, you can probably find a competitive offer almost anywhere. The GoBank account might be the most appealing if you value the retail store locations. GoBank is a low-cost checking account. There are no minimum balances and no overdraft fees. The account doesn't offer overdraft protection, so be aware that your purchases should be declined if you use your debit card to attempt to spend more than you have available in your account. To open an account, you can sign up online at GoBank.com or through the GoBank app for free. Otherwise, you can get a “starter kit” for $2.95 at Walmart stores, which also requires a $20 opening deposit. The account comes with a monthly fee of $8.95, but that fee is waived if you set up direct deposit of at least $500 per month. Some traditional banks require larger automatic monthly deposits, while others require less. GoBank offers 42,000 free ATMs, but you’ll pay $2.50 to use an out-of-network ATM, plus any fees charged by the ATM operator. To open an account with GoBank, get your “starter kit” from a Walmart store, visit GoBank.com or use the GoBank mobile app to complete an application. You’ll have to provide personal information such as your Social Security Number, date of birth, and more. The bank is required to ask for these details under federal law. Currently, GoBank accounts are only available for individuals. You can’t use GoBank for business checking, nor can you open a joint account. That also means the accounts are not available for minors although many other banks offer accounts for the under-18 crowd. GoBank will mail your debit card roughly two weeks after you complete your application. You’ll need to activate the card and verify your contact information. Until you have activated your card, some GoBank features will not be available, such as P2P payments and mobile check deposit. GoBank claims that the account is available to pretty much anybody who can verify their identity. That's good news for people who’ve been turned away by other banks due to bad credit or negative information in ChexSystems files. GoBank is the first Walmart banking product that is completely FDIC insured. As long as you stay below FDIC minimums, your account is protected if GoBank goes belly-up. Currently, it’s not possible to go over the FDIC limit; GoBank has a maximum account value limit of $50,000. You can fund your GoBank account in several ways. You can add up to $2,500 in one day, or a maximum of $3,000 over a 30-day period. Direct deposit: If you use this account, it’s a good idea to set up direct deposit with your employer. A direct deposit of more than $500 per month means you won’t pay the monthly fee of $8.95. In some cases, GoBank allows you to access funds from your direct-deposit paycheck a few days early before your employer actually transmits the deposit. Mobile deposit: You can also use your mobile device to deposit checks. Simply follow instructions in the GoBank app and use your device’s camera to snap a photo of the check. Note that GoBank imposes relatively long hold times on certain deposits (10 days for personal checks), so be aware if you need to spend that money quickly. There are other limits to GoBank’s mobile deposit feature as well, for example, no checks payable to Cash. If mobile deposits are new to you, read more about depositing checks with your mobile device. Add cash at stores: if you’re a regular Walmart shopper, you might enjoy the fact that you can deposit cash at participating Walmarts as well as certain 7-Eleven and Kmart stores. Just present your GoBank debit card to the cashier, and the funds will be added to your account. Adding cash at Walmart is free, but you'll pay a fee of up to $4.95 to add cash to your account if you go through Kmart or 7-Eleven. Electronic transfers: you can also transfer cash to your GoBank account from other bank accounts. However, GoBank does not offer an electronic transfer feature, so you’ll have to initiate the transfer at the sending bank. Funds are transferred via ACH. How do you spend the money in your GoBank account? Again, you’ve got several options. Debit card: to make purchases at retailers or online, you can use your GoBank MasterCard debit card. When you buy your starter kit, you’ll get a temporary card, and after completing your application, you'll receive an official personalized debit card in the mail. Get cash: GoBank boasts free ATM withdrawals from over 42,000 ATMs nationwide. Some of those ATMs reside inside Walmart and 7-Eleven stores. But you’ll also find ATMs at other locations including bank branches. Visit the GoBank website for a map showing free ATMs. Online bill pay: GoBank offers online bill payment for no extra charge. You can set up payees and have GoBank print and mail a check, and some payees can be paid electronically. Anybody in the U.S. can be a payee, including individuals. P2P payments: you can also pay individuals using GoBank’s person-to-person payment system. Enter an email address or mobile number, and your payee will get a message asking them to collect payment. If you pay another GoBank customer, the funds instantly move into their account. People who don’t have a GoBank account can have the funds sent to their PayPal account. 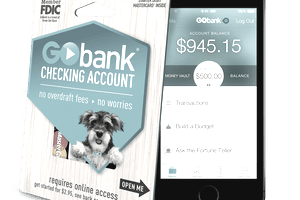 GoBank is a mobile bank offering that offers pretty much everything you require from a checking account. However, there’s no savings account option from GoBank, although the account has a "Money Vault" feature that segregates funds if you want to put aside money for something. This option does not pay interest. When interest rates are low, or your savings balance is nonexistent, that might not matter much, although it’s best to open and fund a savings account that pays interest at some point. While GoBank makes it easy to open an account if you’ve had issues with a bank in the past, the tradeoff might be the relatively long hold time on personal checks and some commercial checks. If you fund your account with direct deposit and rarely deposit personal checks, that might not matter, but it's a different story if you rely on funds from personal checks.